It's almost Easter and we're on the hunt for the best Easter brunches in Southern NH. From live jazz music to Easter Bunny appearances to a wide selection of buffet options, there's something for everyone in the choices below. Most places book up quickly, so get hoppin' on your plans and make a reservation soon! 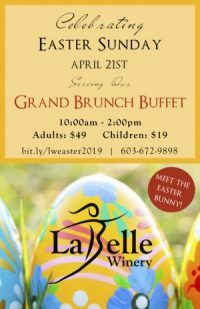 The Grand Brunch Buffet inside Labelle Winery's stunning Great Room features all the classics, including an order-your-own omelette station, ham and prime rib carving station, and breakfast favorites. Also noteworthy, the build-your-own Bloody Mary and Mimosa Bar! And for kids, the Easter Bunny will be hand to give out treats and pose for pictures. 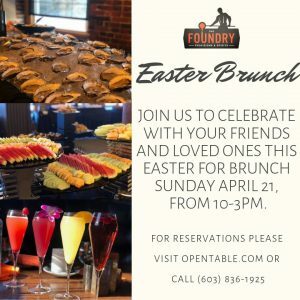 The Foundry hosts a popular weekly Sunday brunch, so of course, their Easter Brunch game is on point. 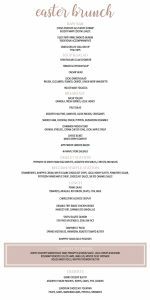 New Hampshire's largest certified farm-to-table restaurant, you can always expect fresh, locally-sourced ingredients at The Foundry. Listen to relaxing live jazz music at Easter Sunday Brunch in Fratello's Amoskeag Ballroom in Manchester. A pasta station, gourmet housemade desserts, and gluten-free options round out this indulgent feast. 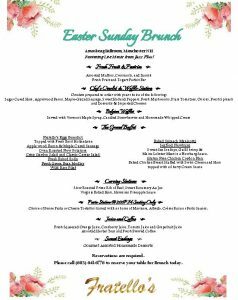 The Derryfield's Easter Brunch's includes seafood dishes, grilled sirloin and a dessert station. Besides the great food, The Derryfield sits on picturesque acres of historic farmland. Speaker's Corner is located inside the DoubleTree by Hilton Nashua and features all your brunch favorites. Not only that, but Speaker's Corner is currently undergoing a renovation. Enjoy your buffet in a beautiful, brand new space! Indulge in an oyster bar, chocolate fountain, Belgian waffle station, and rosemary roasted leg of lamb at a gourmet Easter Brunch in Bedford Village Inn's beautiful Great Hall. 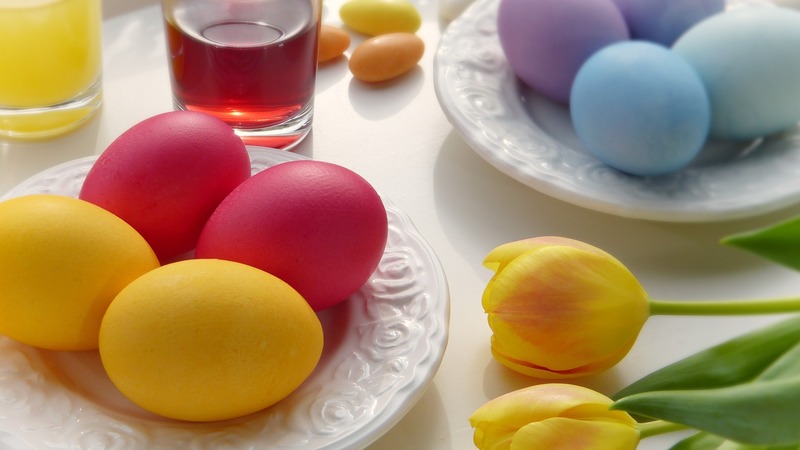 Looking for Easter brunches around the state? 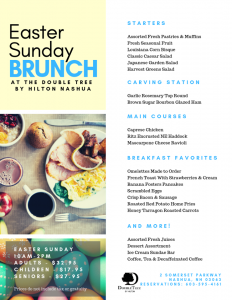 Check out our previous NH Easter Brunch picks here.